Mike Geffner, journalist and former Village Voice columnist, created “The Inspired Word”, originally as a poetry night. It has grown to become a warm, supportive community of creative artists: poets, writers, comics, musicians, and storytellers that meets regularly to share their art. 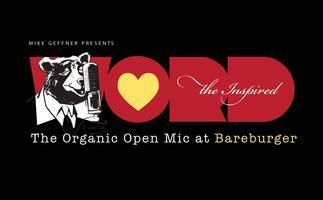 Every Tuesday night at Bareburger in the East Village, Mike hosts “The Organic Open Mic”, featuring 35 slots with a 5-minute per artist time limit. Online payment guarantees a slot on the open mic list, so purchasing in advance is recommended. Bonus: A free drink for the 1st 10 people buying advanced tickets via eventbrite.